Diners got their first look - and taste - of what is on offer at Peterborough’s latest fine dining experience - Prévost on Wednesday night. 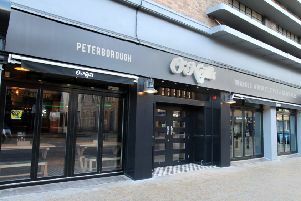 A month after ending his five-year association with Clarkes in Peterborough, Lee Clarke opened the doors of his new city centre venture in Priestgate last night. Set in the former Flyers Club, the new restaurant is the culmination of Lee’s two decades spent cooking, tasting and learning in some of the world’s best kitchens. The innovative tasting menus range from three (£32.50) to nine courses (£75), and everything is sourced as locally as possible - with beef aged by a butcher in Stilton and wild mushrooms foraged from nearby woods. Lee, head chef and owner of Prévost, has promised to guide diners on an “exploration through freshness, texture and taste”, adding: “The opportunity arose to make the dream of owning my own restaurant a reality, and I’m hugely excited to be opening this week. The restaurant - predominantly a centuries-old building with exposed beams, original dark wood features and light coloured walls [acked with work from local artists - is open plan serving just 28 covers, and almost all of the tables will have a view of Lee cooking. There’s also a private dining room upstairs seating eight, and a comfy snug to relax before or after dining. An extensive cocktail menu features the likes of Grasmere Farm Old Fashioned comprising Smoky Bacon Infused Wheat Bourbon, Maple Syrup & Apple.